Filipino fans of the world’s greatest superheroes Batman, Superman and Wonder Woman are in for a treat as the Alliance, the league of the country’s top pop culture stores, brings Batman v. Superman: Dawn of Justice Superfans' Day on March 26, Saturday at Promenade Greenhills Dolby Atmos Cinema in San Juan City. More than 700 attendees are expected to grace in the event, clad in red capes, Bat-armors and golden bracelets. Festivities start at 12 noon with the launch of Hot Toys Cosbaby Figures Batman v. Superman: Dawn of Justice line and DC Fan Collectibles Exhibit by the Pinoy Batman Toy Kolektors. Silverworks is also set to showcase its licensed jewelry based from the movie. At 2 pm, Neutral Grounds will host a HeroClix collectible miniatures tournament, coinciding with Dice Masters and HeroClix displays. The Alliance and partners; and stubs for raffle items. The cinema is equipped with Dolby Atmos, a state-of-the-art sound technology that brings the most awaited gladiator match in history to life. 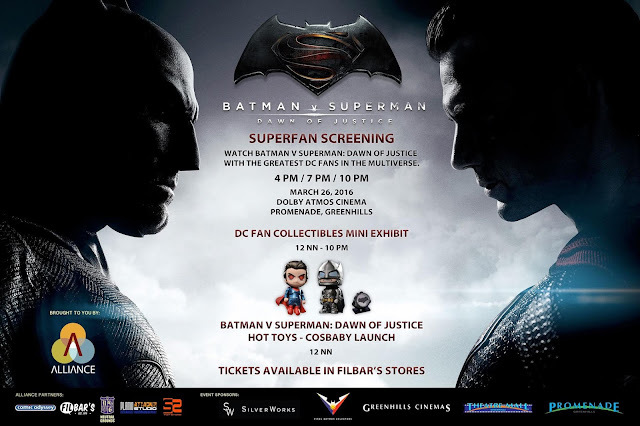 Batman v. Superman: Dawn of Justice Superfan Screenings is presented by Comic Odyssey, Filbar’s, Neutral Grounds, Plamo Attack, and SS Toy Store; sponsored by Silverworks and Promenade Greenhills; and supported by Pacific Licensing. “With the movie, DC fans are finally witnessing the dawn of Justice League and The Alliance is thrilled to be part of this exciting event in pop culture history,” said Jacob Cabochan, one of the founders of The Alliance.